Following in the steps of the English riding master William Cavendish, the Duke of Newcastle, we showcase the skills and majesty of 17th Century horsemanship. Performing in Cavendish’s own indoor riding house within the spectacular setting of Bolsover Castle, Historic Equitation demonstrate the art of classical dressage using the Duke’s well documented humane training techniques. The display at Bolsover Castle is suitable for all the family, from spellbound children to adults (with or without a knowledge of equine practices). The highlight of the show for many are the haute école movements or Airs Above the Ground, due to the power and control that is demonstrated. At the end of the performance, riders and horses alike greet the audience to answer their questions. This is excellent for younger children as they are able to get up close to the horses. 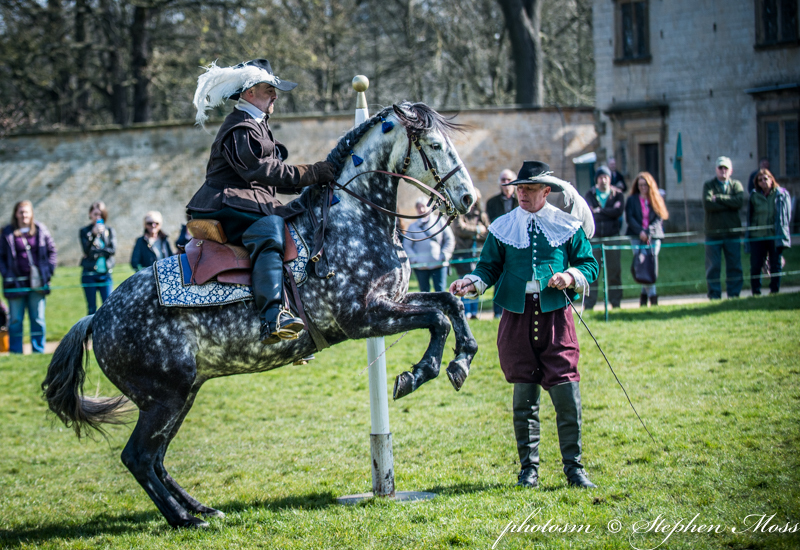 The movements and training highlighted in the Bolsover performances can be incorporated into a lecture demonstration for those interested in either the history of the riding house or the technical details of horsemanship itself. In 2017 Peter Maddison-Greenwell represented Historic Equitation at a lecture demonstration at Newmarket Open Weekend, to showcase how classical dressage underpins our modern equestrian practices. The demonstration was the only non-racing performance of the day and was received with high praise. Would you like to see the horses and riders of Historic Equitation demonstrate their strength and refined skills when performing the art of classical dressage? If so then cast your eye across the Events page where you will find details of the performances at Bolsover Castle along with other venues and sites around the country. Alternatively, if you would like to host a clinic or demonstration at your venue then do get in touch!